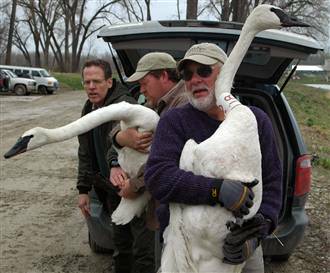 Here’s an MSNBC article from 04 April 2007 about two swans released on an ape preserve in Iowa. The apes were pleased to see the birds, and will even get a chance to name them. Trumpeter swans are America’s largest waterfowl, weighing up to 35 pounds with an 8-foot wingspan. They are Iowa’s only native nesting swan. Once common across much of the continent, they were hunted for their feathers to near extinction by the late 1800s. The swans now have protected status, and their population has grown with help from nesting projects. The Great Ape Trust’s grounds include 40 acres of lakes and wetlands, making it a perfect spot for the swans. And the birds will give the bonobos at the trust an interesting distraction. Bonobos walk on two legs and are the most humanlike in appearance of the great apes. They have sophisticated language skills, a trait they’ll demonstrate when asked to name the swans. Swartz said they’ll either use a board that has symbols the apes associate with objects or choose names from a list researchers provide. The apes already use the board to communicate with humans to identify things like location, food and color. Swartz said after observing the swans, the bonobos could pick a name that they think reflects the birds’ behavior. They’ll also get photos of the swans to carry around. She said the apes can recognize gender, with the help of a tag collar around the male swan’s neck. To learn more, visit MSNBC for the entire article. There are 1 reader responses to "Apes to Name New Neighbors". Thanks for the communication articles. I need them as I’m researching how animals can assist us in our evolution and planetary change! It makes total sense that these great apes would name their new neighbors, wouldn’t we?